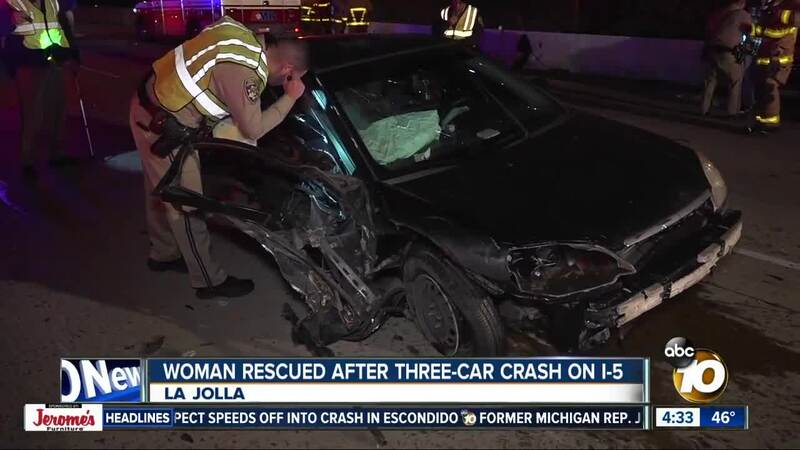 LA JOLLA, Calif. (KGTV) – A woman and three small dogs were rescued early Friday morning after they were trapped in a car that was involved in a wreck on Interstate 5 in La Jolla. The three-vehicle crash, believed to be DUI-related, occurred at around 12:30 a.m. on the northbound side of I-5 near Genesee Avenue, according to the California Highway Patrol. It took emergency crews 10 minutes to remove a woman who was trapped in the passenger seat of one of the cars involved. Three small dogs were also rescued from that same car. The woman and the man driving the car she was in were taken to the hospital to be evaluated. Meanwhile, the driver of the second car involved was OK after the crash but was evaluated for a possible DUI. CHP officers said they believe the third car involved tried to leave the scene but was stopped about a mile away. The driver of that car was suspected of drunken driving.